Target Wrestling presents “4th Anniversary Show” at The Venue, Carlisle on April 22nd. 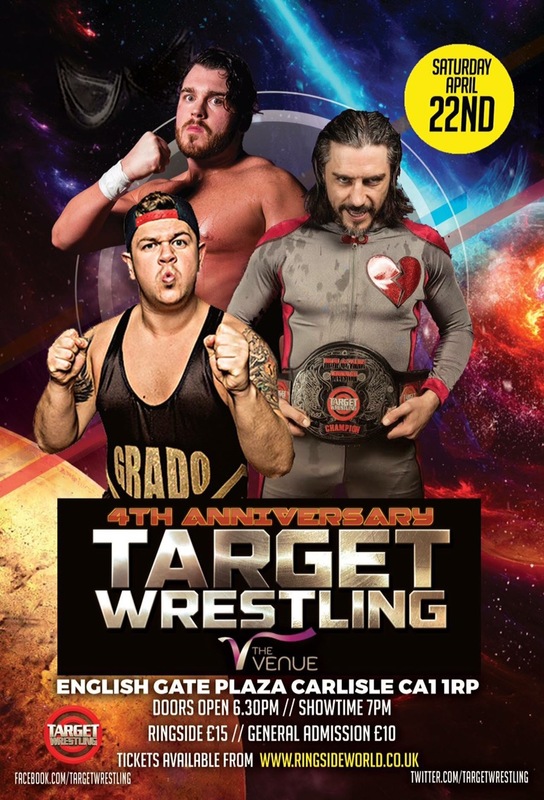 Target have announced a change to the “4th Anniversary Show” card, unfortunately TW High Octane Division Champion, Paul London will no longer be appearing due to injury and Target Management have announced that the title has been officially vacated. Target Wrestling fans, we regret to make the announcement that Paul London has suffered a serious knee injury and will be unable to both fly to the UK and wrestle this Saturday night in Carlisle. Last night we received the call we’ve been dreading to get for the last few days. This past Saturday night in San Diego, Paul London suffered a very serious knee injury during his match. Paul got in touch with us straight away to give us an update on his knee and said he’d hope to still fly to the UK for our Anniversary show. However over the past few days sadly Paul’s injury has not improved and has been told by doctors not to travel long distances, wrestle or aggravate his injury in any way. The health and well being of our wrestlers is our main concern upon any situation, and we’re as devastated as everyone, including Paul that he won’t make the show this Saturday night. Last night we spoke at length with Paul as to what will be best for the future of his High Octane Division Championship and we all came to a mutual agreement that the best case would be to vacate the championship. This was a very difficult decision to make, not just for ourselves, but for Paul London as well, we all know how much he loves this company and that championship, but he also understands that Target need a champion who can defend the belt. HOWEVER, the show must go on! We are Target Wrestling, and we aim to deliver, this is our biggest show of the year and we would never give the fans anything short of a night they will never forget! So with just 3 days notice to the show, we have found a replacement superstar worthy of taking Paul’s place on the show! This superstar will be revealed on the night, this Saturday, but trust us, you will not be disappointed! What’s next for the future of the High Octane Division Championship? Well, we can announce that we have made a decision as to what’s next for the title, this decision will be announced at the show on Saturday night and we will announce what the future holds for the Target Wrestling High Octane Division Championship at the 4th Anniversary show! To end this lengthy announcement we’d just like to send a big thank you out to Paul London who has been an incredible champion here at Target, and as the Target fans chant, he really is one of our own! SEE YOU ALL SATURDAY NIGHT IN CARLISLE, THIS WILL BE A NIGHT TO REMEMBER! HISTORY WILL BE MADE! TW Heavyweight Champion, Shady Nattrass Vs ?